Easter is right around the corner. To get the kids excited about this holiday I thought it’d be great to start doing Easter crafts. 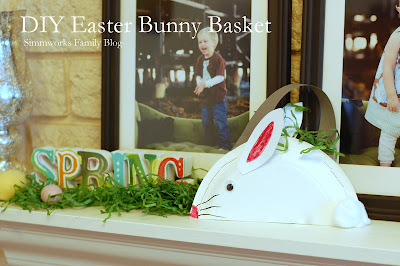 And the first thing that popped to mind was this bunny basket I saw on About.com. My son loved putting it together with me and even decided to do one on his own after I helped him with this one. He loved being able to use the stapler and the scissors. And he surprised me by how well he did with the pen while drawing on whiskers. He’s getting quite skilled! 1. Fold the white construction paper in half. Cut out two bunny ears and set aside. 2. Fold the paper plate in half. 3. Staple up each side of the paper plate 4 times. 4. Use glue dot to add googly eyes to either side of the paper plate. Add a nose to the bunny with the pink marker. 5. Add handle to the top of the paper plate with a staple. 6. Use pink pen to color the inside of the ears. Attach ears to the paper plate with glue dots. 7. Add whiskers to the bunny with the black marker on each side. 8. Place 2 glue dots at the opposite end of the bunny and add a cotton ball for a tail. Repeat on the other side. 9. Stuff with your favorite Easter goodies and have fun! What activities do you like to do with your child for Easter? Check out all of my Easter ideas! What a sweet and neat idea! Thanks for sharing! That is so cute! My son would love making one, we may have to try it. Thank you for sharing! Cute and EASY! I like easy! 😉 Thanks! How cute and creative! A lot of fun for the kids, too. I love it! That’s a cute project. We like dying eggs. I’d like making it with different colors of paper plates. Very cute. Yesterday my sons and I were painting Easter pictures of eggs and baskets.